Play Mobile Bingo at Gossip! The number of mobile bingo players is rising and bingo sites are rushing to offer bingo games and slots on a mobile platform. Gossip Bingo knows the importance of providing a high quality bingo experience and offers up some of the best mobile bingo to all their players. Enjoy a plethora of bingo, slots, and casino games as well as loads of fabulous mobile bingo bonuses! We know you lead a busy life so we make it possible to access all the Gossip Bingo fun on your mobile device! Now it’s super easy to play mobile bingo and slots from your phone and tablet so you never have to skip out on the excitement. You can even pay your bill online, please read our pay by mobile casino page to get the details. 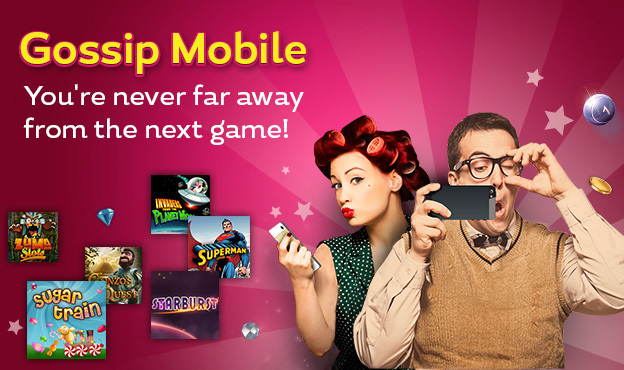 Play on our mobile bingo site or bingo app for the highest quality on-the-go gaming in the UK! What’s all the buzz about mobile bingo? Over the years bingo has become more and more accessible to the delight of bingo lovers everywhere. Online bingo has made it possible to play from home without having to visit a live bingo hall. Now, mobile bingo makes it possible to play anywhere, whether at home or on the go. The simplicity and convenience of Gossip mobile makes it one of the best mobile bingo sites in the UK. It’s simple because all you need is a mobile device and convenient because you have the flexibility to go out without missing any of your favourite bingo and slot games! In addition to all the games you can play, you can also access all other features of the site on your mobile device. Claim all the exciting bonuses and promotions as well as access the cashier and support team. Mobile Bingo with Gossip is like having your own little bingo hall in your pocket! Which bingo games can I play on my mobile? You can access all the same fun and games from your phone and tablet. Join all your favourite bingo rooms and be there for all the MEGA monthly jackpots. Spin loads of mobile slot games and win with the swipe of a finger. When it comes to mobile bingo and slots, Gossip Bingo is the best place to play. Gossip Bingo is all about pampering their players – especially our mobile bingo players! You can claim all the amazing bingo treats from your mobile including bonuses, free bingo, and MEGA jackpot games! For the smoothest mobile bingo experience get the free bingo app on iTunes! The Gossip Bingo app offers all the same excitement as the site and you can access it easily from your iPhone and iPad! While we don’t have a bingo app for Android just yet, Android users can play on our amazing mobile bingo site! Is playing bingo on my mobile 100% safe? Yes. We put an emphasis on the security of our players and our main concern is providing you with the safest mobile bingo experience. Only the most trusted payment and withdrawal methods are offered including the most popular method – PayPal! The same username and password you have created on your mobile device can be used to login on your PC. Just open your PC browser, enter the URL of www.gossipbingo.com and follow the login instruction on the site. On Android devices, such as the Galaxy S series, you just need to open the browser and navigate to www.gossipbingo.com, like you’re used to. You will use the same login information you have been using for the desktop site, and then you can begin playing. On Apple devices such as the iPhone or iPad, open the Safari browser and navigate to the game www.gossipbingo.com.